Differential erosion is a simple concept with a beautiful impact. Variability in rock hardness changes how it is sculpted by water and wind. It's a bit of a tease that geoscientists look at any strange landscape and attribute it to differential erosion, but it's not far off. Top Image: Buttes are formed when a resistant cap-rock protects underlaying softer rock. Everywhere not covered by the hard rock erodes away, leaving a towering hill exposed above the surrounding landscape. Image credit: Wolfgang Staudt. The Zagros Mountains in southwestern Iran are long ridges and valleys dictated by differential erosion. Massive tectonic stress from collision rumpled the landscape into folds. Erosion removed the softer mudstone and siltstone, leaving behind harder limestone and dolomite. Image credit & read more: Earth Observatory. Sandstone with variable resistance to erosion forms these stair-step structures near the Kimberly waypoint on Mars. The foreground has weaker sandstones eroding into flatter steps, while background has stronger sandstones eroded to steeper steps. Image credit & read more: NASA. Turnip Rock is a sea stack in Port Austin, Michigan. The top of the stack has more resistant rock than the bottom, so that the base erodes more quickly. The result is a lopsided stack, although I see it more as a mushroom than a root vegetable. Image credit: canonfather. The oxidized red sandstones alternate with white lakebed sediments in Red Rock Canyon State Park, California. The sandstones are more resistant to weathering, holding their shape better than the soft lacustrine sediments which erode deeply. Explore the Gigapan. Image credit: Ron Schott. The Goblins of Goblin Valley State Park, Utah are actually hoodoos from the weathering of Entrada Sandstone. 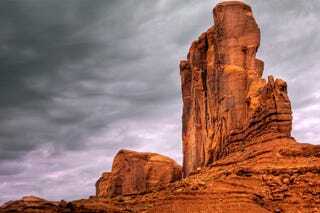 Once upon a time, the Entrada was a tidal flat, with alternating layers of sandstone, siltstone, and shale depositing to build layers of variable strength. Weathering enhances joints and fractures, with the greater surface area increasing weathering further until the goblin is free-standing in the plain. Explore the Gigapan. Image credit: Ron Schott. The red cliffs of Scarborough are softer sediments sitting on top of a hard rock base. The brown rough texture along the base of the cliff is a harder rock, holding a steeper face and eroding slower. The bright red of oxidized, rusted sediments are softer, eroding back in a gentler slope. Image credit: John (shebalso). Sea Stacks form in medium-hard rocks that can hold a steep face, yet are soft enough to erode as free-standing structures along fractures and caves. The stacks at Torre Sant'Andrea have a harder, more resistant base of darker that juts out as platforms fringing the stacks. Image credit: Freddyballo. Variation in thickness of shale levels in a gorge near Hector Falls, New York results in a jagged cliff edge. Image credit: Laurie VanVleet, Ithaca City School District. The Los Castillos rock formation in Quebrada de las Conchas reserve in Argentina has alternating layers of hard rock forming steep faces, and softer rock. The changes in colour also reflect the changing chemical makeup of the rocks, with different minerals weathering through different processes into different colours. (Did I say "different" frequently enough in that paragraph?) Image credit: Mariano Mantel. A pair of large volcanic deposits from explosive eruptions in northwestern Nicaragua show different erosional patterns. The harder rock presents a smooth, steep face, while the soft ash layer erodes in deep gullies. As the ash is eroded, it is carried away, but not very far: you can see it deposited at the base of the cliff as a splaying fan. Image credit: Ian Saginor. If you're craving more physical sciences stories, head over to the Space subsite. Do you have any favourite examples of differential erosion? Please share them!